The pool is finally open! Let the summer season entertaining begin! After a series of unexpected false starts, we're nearly ready to entertain guest around the pool this summer. No small amount of new gray hair growth and under breath muttering could be heard the last few weeks in my should-be backyard oasis. A new in ground pool filter, rebuilt pool pump motor and no shortage of finger crossing later and we're almost ready! According to a recent Procter & Gamble survey, only 25 percent of consumers clean their grills and only 20 percent of consumers clean their outdoor furniture. Although the waters are blue and inviting, during the chaos of pool opening, we have neglected to prepare the rest of our outdoor entertaining components to accommodate our guest. I was surprised to learn we are not alone in our negligence. Admittedly, we usually do clean our outdoor furniture and grill at the start and end of each season. The job, however, hasn't been terribly easy. With a fleet of lounge chairs, deck boxes, wicker and tables, not to mention the pool paraphenalia, this Mom is welcomes help! 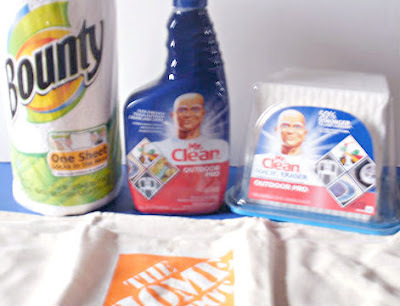 With mind to treating my summer guests to a clean outdoor oasis, as well as maximizing the life of my outdoor pieces, I was pleased to have an opportunity to put some specialty Proctor & Gamble products to the test! Highly motivated to get the rest of our outdoor living area ready for guests, putting the power of Mr. Clean Outdoor Pro to work on our chaise lounge chairs made quick work of the seasonal clean up job! Strong and packed full of Mr. Clean cleaning power, the Magic Eraser cleared away the grime and old season dirt with ease. I love that I can use, rinse and reuse these sturdy cleaning wonders! The Hubs went to work right away with the Mr. Clean Outdoor Pro cleaner and found the job of sprucing up our grill much easier than usual! More effective cleaning tools and less elbow grease is always high on his priority list! Strong Bounty One Sheet Paper Towels made cleaning up after the clean a breeze, rather than another chore. While some bargain towels might save a few pennies initially, we'd rather do the job right with less waste! Clean Pre and Post Season ~ Post season cleaning makes pre season cleaning quick & easy! Handle Repair Post Season ~ Complete repairs and refurbishing post season to maximize your time to enjoy summer entertaining. Cover & Store with Care - Choose a storage area that will keep your stored outdoor furniture out of the rain and snow. Protect finishes and fabrics with covers and tarps. Buy New Pieces Mid or End Season ~ maximize your outdoor living buying power by picking up new and replacement pieces during or after season for best prices. Proctor & Gamble is generously offering That's What She Said readers a chance to win their own Summer Spruce Up Cleaning Prize Pack as shown above. This Prize Pack contains: 1 - Mr. Clean Outdoor Pro Magic Eraser Multi Pack, 1 - Mr. Clean Outdoor Pro Spray, 1 - roll Bounty One Sheet Paper Towel and 1 - Home Depot Logo Leather Craft Multi Pocket Natural Canvas Apron. This giveaway is open to resident of US, 18+ and will end on Sunday, July 22, 2012 at 11:59pm EST. Winner will be selected randomly from all eligible entries via Random.org. Winner will be notified by email and will have 48 hours to respond before I must move on to a Runner Up. This Summer Spruce Up Cleaning Prize Pack is provided by Proctor & Gamble. * Via a comment to this blog post, share with me your best summer spruce up tip or an outdoor living project you'd like to tackle this year. ~ 1 entry. * Via a comment to this blog post, tell me if you have used any of the Prize Pack products. What did you think of them? ~ 1 entry. * "Like" Mr. Clean Magic Eraser on Facebook, leave Facebook name in comment below ~ 1 entry. * "Like" That's What She Said on Facebook, leave Facebook name in comment below ~ 1 entry. * Follow That's What She Said (@tsue1136) on Twitter, leave Twitter name in comment below ~ 1 entry. * Give That's What She Said G+! Click button on top left side bar and leave your G+ name in a comment below ~ 1 entry. * Enter another That's What She Said Giveaway, leave comment telling me which you entered ~ 2 entries. * Comment on any non-giveaway post, leave comment below telling me which ~ 2 entries. * Follow Just Like June (@momsmutterings) on Twitter, leave Twitter name in comment ~ 1 entry. * Follow 3 Princes & A Princess 2 (@crystalnjoe1105) on Twitter, leave Twitter name in comment ~ 1 entry. * Follow Closer To Lucy on Twitter, leave Twitter name in comment ~ 1 entry. * Follow HaveSippy on Twitter, leave Twitter name in comment ~ 1 entry. NOTE: if you email address if available through your comment name link, you do not need to leave your email address in your comment. If you email address is not available via your comment name, please leave your email address in anti-spam format in your comment. comment #126, courtesy of Random.org! I received a Summer Spruce Up Cleaning Kit courtesy of Proctor & Gamble for the purposes of exploring to create this feature. The opinions above are both honest and my own. Some images and information sourced from various Proctor & Gamble or Home Depot sites. Facebook, Pinterest and Google+ are not involved in nor responsible for this giveaway in any fashion. Sponsor is responsible for supplying prize. Pool Image. One of the best investments we made for our outdoor area was a power washer. We love using it at the beginning of every season to clean off the deck and out door furniture so it is all fresh and clean for the season. I've used the Mr. Clean Magic Eraser before for our bathroom shower. It's great at cutting through soap scum. I gave That's What She Said G+! Summer is hot...cleaning is exhausting...my tip: let someone else do it - or just wait for the winter when its cooler. My spruce up tip is to put down new mulch outside. I plan on repainting the back patio this summer. Cleaning Tip: wash the bird poop off the patio furniture! I use Bounty papertowels fairly often. Well, we're getting rid of our above-ground pool, and I'll need to tidy up that bare spot! Bounty paper towels - use them All the time! I need to clean up the Pool area! I have used Bounty and I lOve its' durability! for tough jobs! I lIke Mr. Clean on Facebook! I like Thats What She Said on Facebook! I follow Thats What Shwe Said on Twitter! I gave Thats What She Said G+ 1! I follow Just Like June On Twitter! I follow Three Princes and a Princess 2 on Twitter! I follow Closer To Lucy on Twitter! I follow Have Sippy on Twitter! I dont put off Mowing my Grass! I would like to tackle cleaning the stains off my front patio. 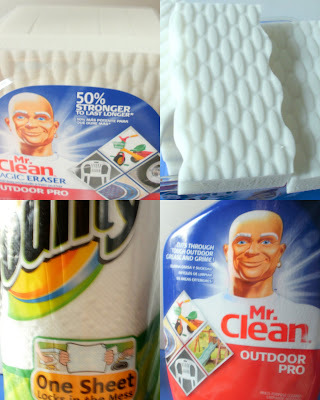 I have used Mr. Clean magic eraser and it is a fantastic product to remove stains. I gave That's What She Said G+! from Maryann D.
We need to remodel the deck! I entered Fit Moms For Life. I'd like to add some trees and bushes to the backyard for shade. I also would like to add more lighting. I've used Bounty One Sheet Paper Towels and they work great at cleaning up spills. I'd like to tackle my awful looking backyard that the dog dug up. I think sprucing up can be as simple as de cluttering the outdoor space. I have used the Bounty paper towels. I would love to start a small garden! I am looking to buy a house and we'll need some shrubbery in our yard. I'd like to get our siding power washed! I really need to clean up my patio furniture and replace the cushions. We'd like to overhaul our backyard into something more fun to hang out in. I really need to wash my house. The siding is so dirty. I have used Mr. Clean Magic Erasers before, but I've never tried the new ones. The original ones work great to clean the shower, so I'm sure the new ones will make life even easier. I've used Magic Eraser indoors and it works wonders! we need to fill up some holes the dog dug up in the backyard and make the back yard level. An outdoor living project I would like to complete is a privacy fence for a portion of the yard. I use the Mr. Clean Magic Eraser frequently. It's one of my favorite cleaning tactics. My project is to clean our grill. The project I need to tackle is repotting all my plants. Thanks for the giveaway. I like to use Bounty paper towels. I'd like to make the outdoor unit to the heat pump look better. The weeds grow behind it taller than the unit, so I was thinking about laying down a thick layer of decorative grave. I would like to takle cleaning up all the plants, bushes,etc in the yard. I would just like to HAVE an outdoor area! We are planning on completely re-landscaping our backyard!! I like Mr. Clean Magic Eraser on facebook. I plan to screen in my porch. The Magic Eraser did a wonderful job on them. I use a Magic Eraser a lot to clean with. It makes cleaning so easy. Liked Mr. Clean Magic Eraser on fb. Liked That's What She Said on fb. Follow That's What She Said on Twitter. I'd love to put some unique lighting in our backyard. I try to sweep off my back deck as often as possible so that the wood stays sturdy; the combo of wet leaves and summer rain storms can make a mess and weaken the wood. we just moved so i am trying to get the backyard together, our house came with a very nice but rather dirty patio set! I need to powerwash and paint the deck. My son-in-law and grandson just finished building a new set of back door steps with a nice landing. Now the dogs can go in and out comfortably and it is large enough to sit outside on a nice evening as well. Have definitely used Bounty, and like them well enough. Haven't used any of the others, but have used an indoor Magic Eraser, which I liked a lot. I need to clean my outdoor furniture. I've got to get my windows cleaned! Well unfortunately my outdoor living project is putting a new roof on my porch so I can enjoy sitting outside. So maybe next year will be beautifying the out doors area.